Hi guys, in this post I will explain how can you use SailBoat exercise as a tool for a retrospective. I learned this exercise a few years ago. A few weeks ago I saw an upgrade in Pedro Gustavo blog. This exercise can be found in the book: “Getting Value out of Agile Retrospectives”, a book written by Ben Linders and me with the foreword from Esther Derby. The book can be downloaded by free in LeanPub.com or InfoQ.com, please download it and spread it within your colleagues. From my experience, this technique is quite appreciated by teams because of its simplicity. 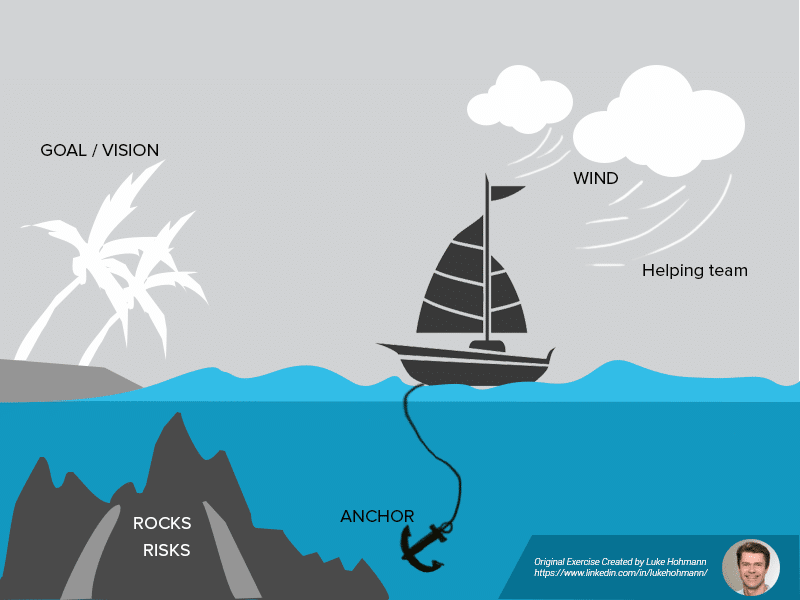 This exercise helps teams to define a vision where they want to go; it helps them to identify risks during their path and allows them to identify what slows them down and what helps them to achieve their objectives. I believe this method is quite simple and does not require any special occasion. Although, it might be interesting for situations when a retrospective is conducted with more than one team at the same time. I had a situation, not long time ago that two teams worked together and because of their level of dependency on each other, they decided to conduct a common retrospective because of some ongoing issues. Using the SailBoat exercise can be extremely interesting, because we simply put the name of both teams on the SailBoat and we remind everyone that we are on the same SailBoat navigating to the same direction. This technique reveals all good things and less positive things performed by a team. The SailBoat exercise is suitable for any team; it does not require any specific level of maturity. This retrospective is quite simple. First, we draw a SailBoat, rocks, clouds and couple of islands like it is shown on the picture on a flip chart. The islands represent teams´ goals/vision. They work every day to achieve these islands. The rocks represent the risks they might encounter towards their vision. The anchor on the SailBoat is everything that is slowing them down on their journey. The clouds and the wind represent everything that is helping them to reach their goal. Having the picture on the wall, write what the team vision is or what are goals as a team. After that, start a brainstorming session with the team allowing them to dump their ideas within different areas. Give ten minutes to write their ideas. Afterwards, give 5 minutes to each person to read out loud their ideas. At this point discuss together with the team how can they continue to practice what was written on the “clouds” area. These are good ideas that help the team, and they need to continue with these ideas. Then spend some time discussing how can the team mitigate the risks that were identified. Finally, together with the team chose the most important issue that is slowing the team down. If you do not find an agreement within the team about the most important topic that should be tackled, you can use vote dots. In the end, you can define what steps can be done to fix the problem, and you can close the retrospective. Like many other exercises, this exercise does not require a collocation of a team. You can use, for example, tools like Lino, to apply the exercise to non-collocated teams. This tool allows us to do everything that we need to run this exercise. What do you think? Your feedback is always extremely important for me, so please leave me your comments. Interesting ..better than just writing Good Bad and Ugly on a whiteboard! Luis, I really like your idea. One thing I would do differently: rather than getting everybody to talk about all their rocks anchors and clouds, I would get the people to write it on post its, stick them on the whiteboard in the appropriate location so that you are able to put some of the common points together saving time. I will include your feedback. A nice little metaphor, and as rumadak says, better than just writing dry headings on the whiteboard! Thanks for sharing this great retro tool. We used it in a even more simplified version with just the boat, anchor and wind. I like its simplicity and the picture connection that really is another way and fast opener in a retrospective. Another side aspect is that having in on a flipchart narrows the space to use for the feedback – preventing to many things collected that you can’t process in a retrospective. To be honest I would even reduce the time for the brainwriting to 3′ – as it will show the most important things. I used the boat retrospective a while ago. I first started only with the wind/sails and the anchors. When inspiration got low, I added the rocks and an outboard motor. Both resulted in additional aspects which were not covered before. Thanks for the explanation, I was looking for it, since I have been participating this game some time ago. Now I want to use it as a moderator. I think, it’s a really good. I would add a treasure to the island, to emphasize the goal and what can be achieved by reaching it. Thank you Luis. In my point of view, this exercise is one of the best metaphor, which can be used to wake up team members brains. It’s very simple and intuitive. Thank you for a great post, which I just revisited, after having used this exercise with success before.